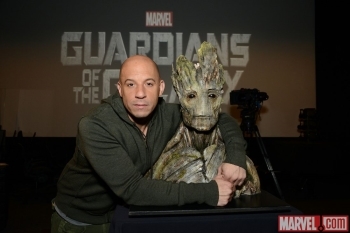 Marvel has officially confirmed that Vin Diesel will join the Marvel cinematic universe as plant-like alien Groot. Action star Vin Diesel, known for his roles in the Fast and the Furious and Riddick franchises, is joining the world of Marvel superheroes as a tree. Not just any tree, mind you - a sentient, extraterrestrial, noble tree-like creature, able to regrow from a tiny sprig, control trees, and absorb wood to strengthen himself. Diesel joins an impressive ensemble of actors for the galactic epic. Actors Chris Pratt, Zoe Saldana, Bradley Cooper, Benicio Del Toro, John C. Reilly, Karen Gillian, wrestler Dave Bautista and screen legend Glenn Close have all been confirmed. Guardians of the Galaxy is slated for release August 1, 2014. Marvel's Guardians of the Galaxy stars an unusual group of superheroes. In its latest comic reboot in 2008, the heroes include Bug, Drax the Destroyer (Bautista), Gamora (Saldana), Rocket Raccoon (Cooper), and Star-Lord (Pratt). Groot was one of the founding members of the Guardians, and the team spends its time defending the galaxy from the machinations of Thanos, who was toothily revealed in the credit sequence of Joss Whedon's Avengers. The Guardians of the Galaxy will probably serve to further introduce Thanos as a threat to the Marvel Cinematic Universe. Previous speculation had Diesel playing anyone from Avenger Giant Man (aka Ant Man) to the powerful super villain Thanos himself. Diesel teased fans in October with a video of himself on stilts and saying that he plays "a seven-and-a-half-foot tree." After the official confirmation from Marvel, Guardians of the Galaxy director James Gunn commented on the bust of Groot in the reveal photo on Facebook. Gunn writes, "It is very close to how he looks in the movie. We have slightly tweaked it in animation, and to my mind, it looks even a little better." Diesel will lend his voice and provide the motion capture for animating the alien tree.